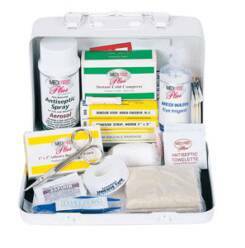 14 " x 9-1/2" x 3 "
Our large vehicle kit is packed with several first aid products to assist with any accident. This heavy-duty, large metal vehicle kit is crush, water and dust resistant, with a gasket to insure dryness. The kit can either be mounted in the vehicle or transported between vehicles. Perfect for school buses, hotel vans, delivery trucks, farm vehicles and anywhere several people are being transported each day. Contact Us for pricing or additional information. 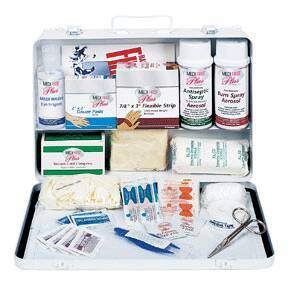 Note: First Aid Kit contents can be customized to fit your specific application. 9 -1/2" x 6-3/4" x 2-3/4"
The standard vehicle kit is ideal for company vehicles or the family SUV. This heavy-duty metal kit measures is crush, water and dust resistant, with a gasket to insure dryness. The kit can either be mounted in the vehicle or transported between vehicles. 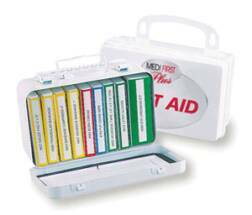 Plastic 7-7/16" x 4-5/8" x 2-3/8"
Each unitized kit is filled with the color coded clearly marked units to insure protection for most on-the-job medical emergences.